It's a good habit to always delete the 'scriptCache.package' file when you install or replace a scripted mod. July 2nd, 2012 - Added 'Special' version of the mod. The interaction is autonomous for everyone, including workaholics. It may work on previous Patch Levels too, but it's only been tested and proved working on 1.63 up to 1.67, so use it at your own risk. This mod replaces the "WorkFromHome" interaction with a custom one. This means that any mod that aims at changing that interaction, won't work. If you want the interaction to be NoAutonomous and you already have a mod for it, use my NoAutonomous version instead, or it won't work. 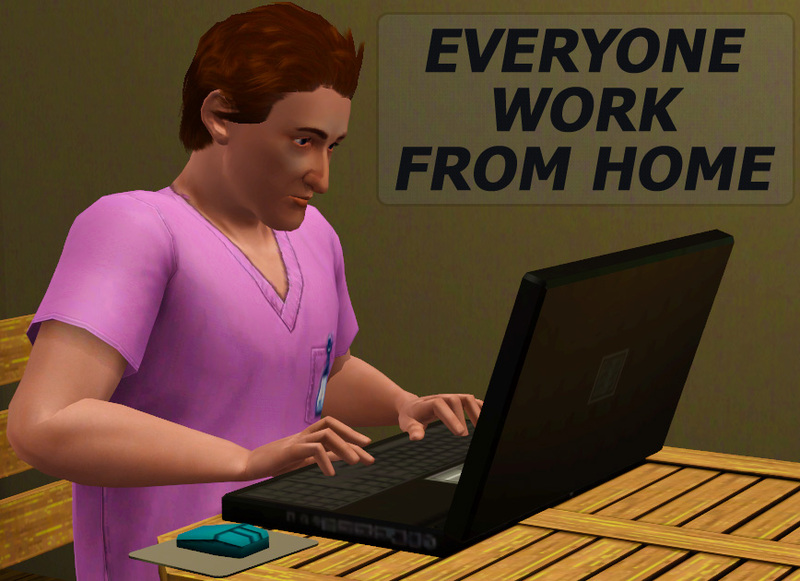 This mod replaces the "WorkFromHome" interaction with a custom one that is available for all sims and not just Workaholics. In addition to the code altered by the script, also two ITUN files have been changed in this mod, specifically WorkFromHome_Computer and WorkFromHome_HoloComputer. I didn't make it autonomous for all the other sims just to keep a bit of realism but if you want it for other sims as well, download the Special version. You don't need to have EPs installed, it will work fine with the Base Game only, as long as your game is patched up to date. Do not tickle it or it will pee its pants! JunJayMdM.EveryoneWorkFromHome.zip | Description: January 14th, 2014 - This is the &#039;Standard&#039; mod. The interaction is autonomous only for workaholics. USE ONLY ONE!!! JunJayMdM.EveryoneWorkFromHome.NoAutonomous.zip | Description: January 14th, 2014 - This is the &#039;No Autonomous&#039; mod. USE ONLY ONE!!! JunJayMdM.EveryoneWorkFromHome.Special.zip | Description: January 14th, 2014 - This is the &#039;Special&#039; mod. The interaction is autonomous for everyone, including workaholics. USE ONLY ONE!! !